Vinalines is seeking approval from the government for building two container terminals at Lach Huyen Port in northern Hai Phong City. Nguyen Canh Tinh, director of the state-run Vietnam National Shipping Lines (Vinalines), said its subsidiary, Haiphong Port JSC, would build terminals No.3 and No.4 at the port. He said the Haiphong Port JSC used to work mainly at Hoang Dieu terminal, which has now been taken over for the construction of an urban area, and so new terminals are needed in its place. The two proposed terminals would have a total length of 750 meters and the capacity to handle vessels of up to 100,000 DWT (8,000 TEU), and cost around VND7 trillion ($299 million), he said. Thousands of containers containing recyclable and used materials are piling up at seaports in the localities of Hải Phòng, HCM City and Bà Rịa–Vũng Tàu, reducing the productivity and efficiency of ports’ operations and negatively affecting the import-export activities of Vietnamese enterprises. 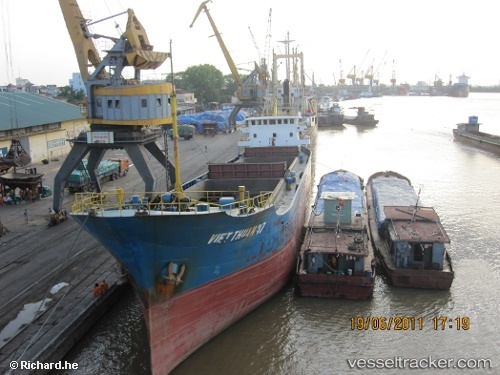 According to the report issued by the Việt Nam Maritime Administration, by the end of May, nearly 28,000 containers were stuck at seaports, including nearly 6,800 containers in Hải Phòng City ports, 14,600 in HCM City and about 6,500 in Bà Rịa–Vũng Tàu Province. The main causes, the administration supposes, are changes in international trade policies which create uncertainties in the market forecast. China, for example, announced to stop importing 24 types of used and recyclable materials from January, 2018. The huge amount of those goods has to find its own way to other Asian countries including Việt Nam. VietNamNet Bridge – The northern city of Hai Phong’s People’s Committee has established an inter-sectoral inspection group to examine inland waterway vehicles, including tourist boats, operating in the city. Hai Phong, manage tourist boats, tourist complaint, Vietnam economy, Vietnamnet bridge, English news about Vietnam, Vietnam news, news about Vietnam, English news, Vietnamnet news, latest news on Vietnam, Vietnam The move comes after a scandal reported by an Australian tourist in the middle of last month. Nguyen Van Luyen, chief secretary of the office of the city’s Road Safety Committee, said inter-sectoral inspectors were expected to examine all inland waterway vessels and passenger boats in the city from May 29 to June 9. “Vehicles that fail to meet operational requirements will be suspended,” he said. According to the city’s Transport Department, there are 322 steel boats, 171 wooden boats, 55 aluminium boats and 19 fibre-reinforced plastic ships and boats operating in the city’s waters. Of these, 15 are registered to operate on four fixed routes: Ben Binh-Cat Ba downtown station, Ben Got-Cai Vieng, Dinh Vu-Cai Vieng and Dinh Vu-Ben Got-Cai Vieng. Another 117 passenger boats are registered to offer contract-based services.